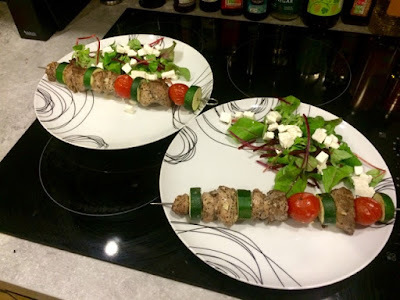 Inspired by my recent trip to Suvlaki, I decided to make some meaty skewers of my own. 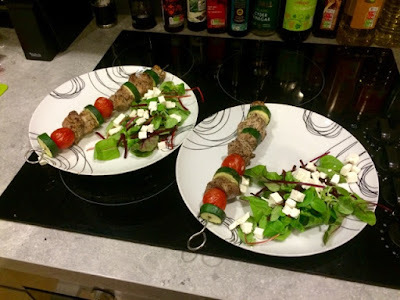 Quick kebabs are a favourite midweek meal of mine. They’re insanely easy to assemble, quick to cook and easy to spice up by just throwing on any herbs and spices you have knocking about in the cupboard. I kept the theme Greek with these ones by choosing to use the classic combination of lamb and mint and serving a Greek salad on the side. You could easily stick to keeping these purely meaty but I like to squeeze some veggies onto those skewers as I’m a bit of a veg-aholic and throw as many into my meals as I can manage. Courgettes and cherry tomatoes are ideal for kebabs as they grill well and cook through in time with the meat. Aubergine works well and onion, but keep it chunky else it can have a tendency to burn at the edges. Adding a few chunks of halloumi cheese would also work brilliantly and fits in nicely with our Greek theme. 1. Preheat your grill to a high heat. You can do this under the grill in the oven, in a griddle pan, on an open worktop grill or on the barbecue. 2. 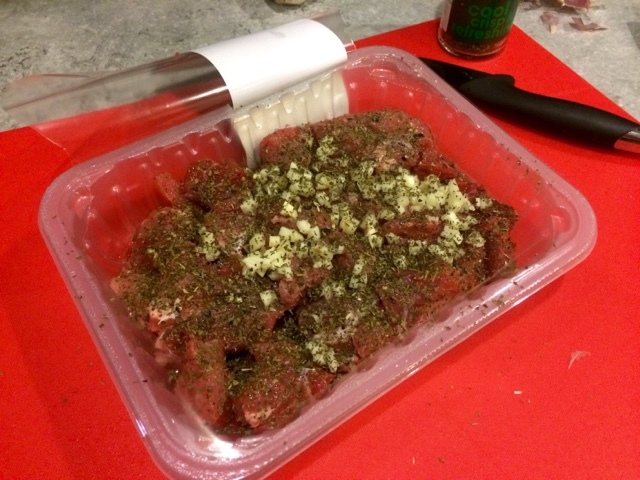 Add the garlic and red wine vinegar to the lamb, sprinkle generously with the mint, cumin and salt and pepper. Mix everything together until all the meat is coated. You don’t need to dirty a bowl to do this, I often marinate meat in the packet it’s come in to save on washing up. 3. Place skewers onto/under the grill and cook on a medium to high heat for around 10-15 minutes. Turn regularly to ensure even cooking on all sides, unless you are using a fan grill in the oven. 4. Serve with salad leaves dressed with crumbled feta and balsamic vinegar. 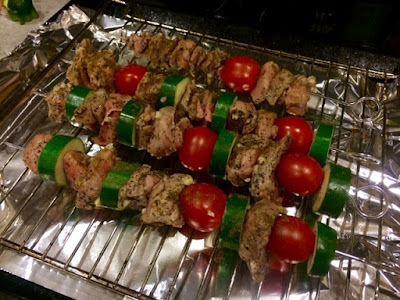 Here are a few other ideas for yummy dinners cooked on sticks… Don’t be put off if I’ve done them on the barbecue, you can do them just as easily under a normal grill in your oven or on a griddle pan on the hob.